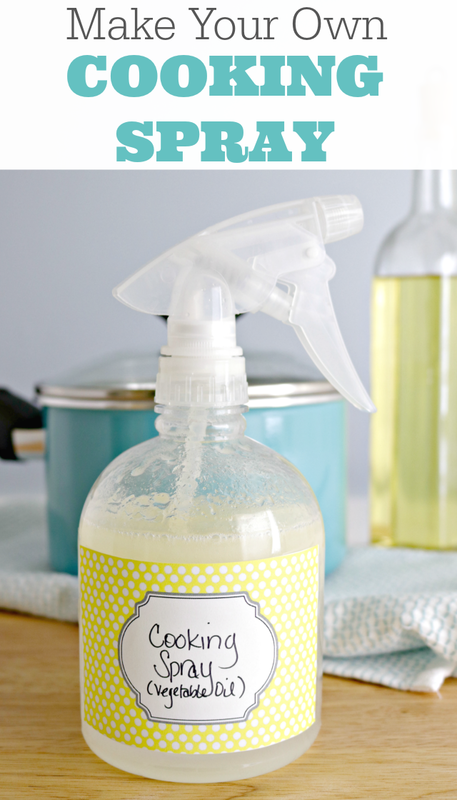 This tutorial shows you How To Make Homemade Cooking Spray using only two ingredients and no crazy chemical additives! I have used cooking oil spray my entire adult life and never really realized that I could make my own. For one, now I know EXACTLY what is in my cooking spray because I am making it myself. The second thing, no crazy additives, chemicals or things that I cannot even pronounce. And the third thing, I’ll likely never run out of cooking spray again! Since I’ve been making my own cooking spray, I couldn’t be happier with the way it works. I can make cooking spray using any oil I like, so I can use different cooking sprays depending on what I’m making. 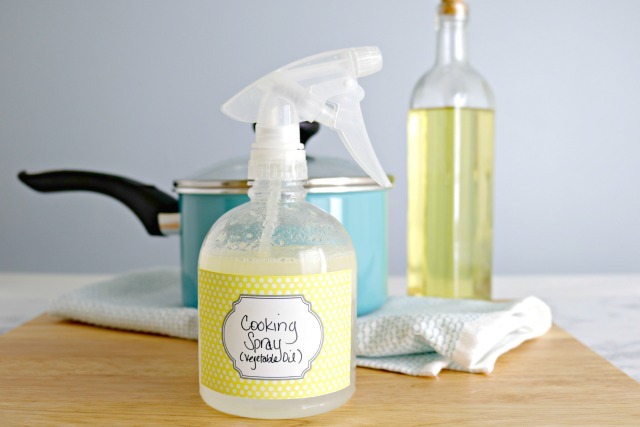 My favorite by far is olive oil cooking spray, but for this tutorial, I’m going to use vegetable oil! This post contains affiliate links, which means that if you make a purchase using one of the links, I will receive a small commission. 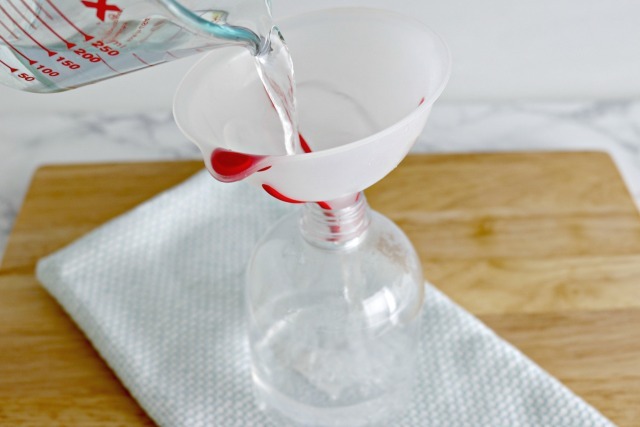 Start by adding 1 cup of distilled water to your spray bottle. Next, add 1/4 cup of the oil of your choice. 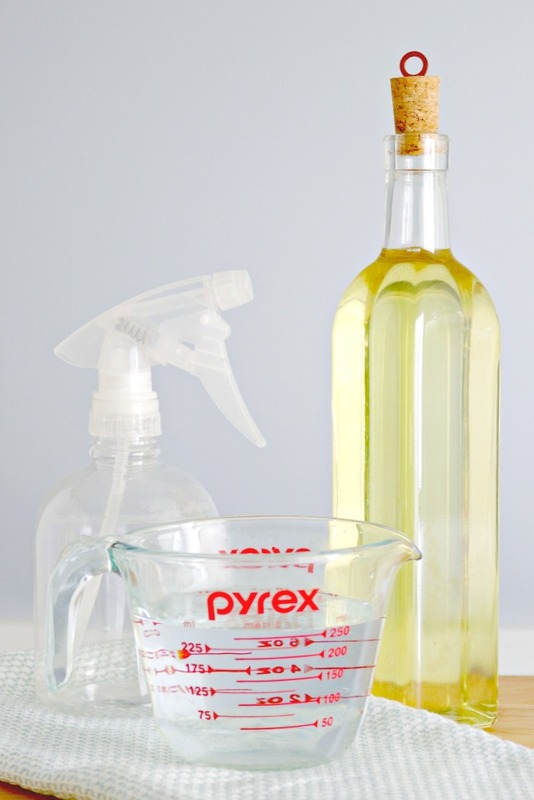 Shake well and be sure to label your spray bottle so you know what kind of oil is in the bottle! You can print and use my Free Printable Labels HERE! Simply spray your pots, pans and baking sheets before use for a wonderful, non-stick cooking experience! 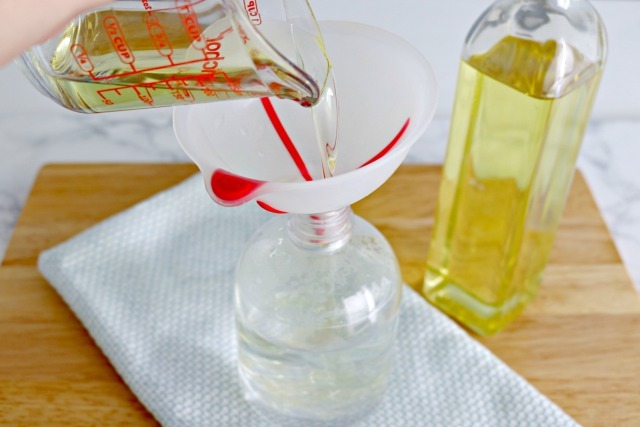 I like to use vegetable oil spray for baking and olive oil spray for most other cooking. You can definitely feel good about this cooking spray because you know exactly what’s in it. ***NOTE*** This mixture needs to be shaken before each use. Because it doesn’t contain chemical binders, the oil and water will not stay mixed together. Like cleaning hacks and home tips? 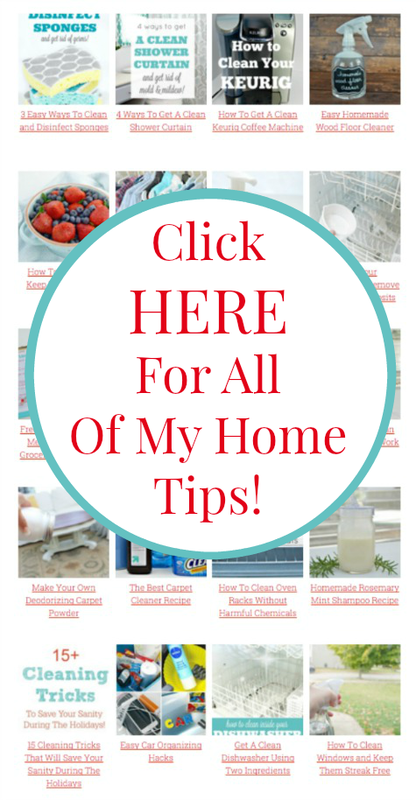 Check out hundreds of my home tips, homemade cleaning and cooking recipes along with easy cleaning hacks HERE on my Home Tips Page! Couple questions…What is the shelf life? Does it need to be refrigerated? I like this alternative to store-bought! Thanks. One question…. why mix with distilled water? I usually use straight oil. I CAN’T SEEM TO FIND A SPRAYER THAT ACTUALLY SPRAYS. THEY JUST SHOOT OUT AND OFCOURSE MAKE MESS ALL OVER. Thank so for this recipe! I have one question though, oil and water don’t mix unless emulsified. How have you found this to work? Do they separate? I’ll be trying it myself soon as I get a spray bottle. Doesn’t the water mixed in oil splatter when put in the frying pan? Nope…not if shaken well before use. 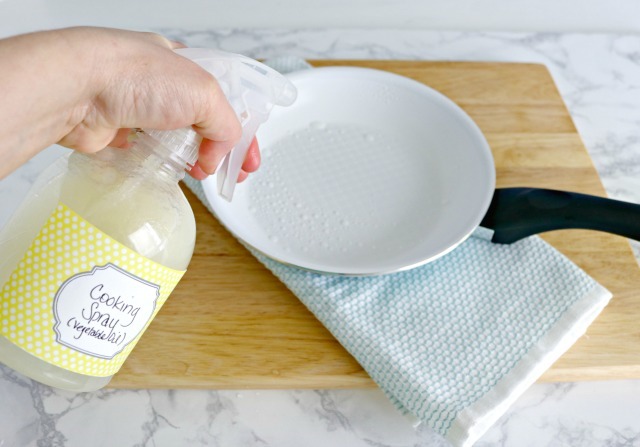 Jessica, of all the DIY bloggers, YOU are the most informative I have found for cleaner and healthier household products. Thank you so much for sharing with us your wealth of knowledge. God bless and keep up the awesome work! Your site is my favorite. I have made so many of your DIY recipes. How to get distilled water? Hi, Barbara! You can either buy distilled (or bottled) water, or you can boil tap water and let it come back down to room temperature. Hope this helps! One thing: I made my own oil spray. However, it will not spray. It just SHOOTS OUT. Even if I shake like crasy. I gave my brother a Christmas gift of my favorite things and he loves the toilet bombs so much that we made them togeeather as a project. He wants to get togeatheer again and make more projects. Thanks. For your recipes. I enjoy reading your cleaning tips. I noticed in this volume you had a method/ solution for getting rid of fruit flys. I’ve used it and it works so well that we no longer have a fruit fly problem. However, we do have a moth problem ( probably pantry moths ). We’ve cleaned our cabinets but still have these tiny moths in several rooms upstairs and down. Do you have a solution ( ala fruit fly solution ) to capture and eradicate these moths? Thanks for your assistance. Use yellow sticky traps (Amazon). Dryer sheets jn cabinet will repel. I have tried this on the muffin liners. They just get soaked from water and the baked muffins stick so much I have to eat half the muffin from the paper. (Not that I mind much – I still leave no crumbs behind ;) ). What would you suggest I tweak?